Traditionally, cross-layer and joint source-channel coding were seen as incompatible with classically structured networks but recent advances in theory changed this situation. Joint source-channel decoding is now seen as a viable alternative to separate decoding of source and channel codes, if the protocol layers are taken into account. A joint source/protocol/channel approach is thus addressed in this book: all levels of the protocol stack are considered, showing how the information in each layer influences the others. 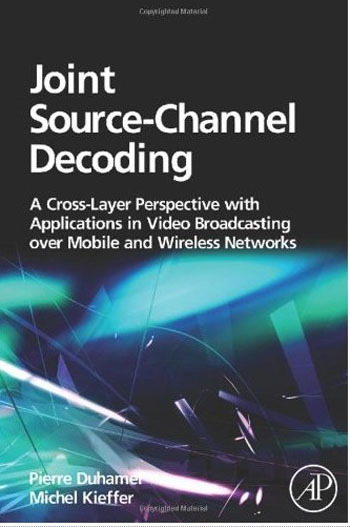 This book provides the tools to show how cross-layer and joint source-channel coding and decoding are now compatible with present-day mobile and wireless networks, with a particular application to the key area of video transmission to mobiles. Typical applications are broadcasting, or point-to-point delivery of multimedia contents, which are very timely in the context of the current development of mobile services such as audio (MPEG4 AAC) or video (H263, H264) transmission using recent wireless transmission standards (DVH-H, DVB-SH, WiMAX, LTE). This cross-disciplinary book is ideal for graduate students, researchers, and more generally professionals working either in signal processing for communications or in networking applications, interested in reliable multimedia transmission. This book is also of interest to people involved in cross-layer optimization of mobile networks. Its content may provide them with other points of view on their optimization problem, enlarging the set of tools which they could use. Pierre Duhamel is director of research at CNRS/ LSS and has previously held research positions at Thomson-CSF, CNET, and ENST, where he was head of the Signal and Image Processing Department. He has served as chairman of the DSP committee and associate Editor of the IEEE Transactions on Signal Processing and Signal Processing Letters, as well as acting as a co-chair at MMSP and ICASSP conferences. He was awarded the Grand Prix France Telecom by the French Science Academy in 2000. He is co-author of more than 80 papers in international journals, 250 conference proceedings, and 28 patents. Michel Kieffer is an assistant professor in signal processing for communications at the Universite Paris-Sud and a researcher at the Laboratoire des Signaux et Systemes, Gif-sur-Yvette, France. His research interests are in joint source-channel coding and decoding techniques for the reliable transmission of multimedia contents. He serves as associate editor of Signal Processing (Elsevier). He is co-author of more than 90 contributions to journals, conference proceedings, and book chapters. Joint Source-Channel Decoding A Cross-Layer Perspective with Applications in Video Broadcasting Fast Download via Rapidshare Hotfile Fileserve Filesonic Megaupload, Joint Source-Channel Decoding A Cross-Layer Perspective with Applications in Video Broadcasting Torrents and Emule Download or anything related.